The first thing I notice when I walk into a new bathroom is the sink faucet. It is the one feature in a bathroom you can change for little cost and drastically improve the overall appearance of your bathroom. There are so many sink faucets available which makes it difficult to know which one to buy. We have reviewed our top 12 favorite faucets to give you an idea on the various options that exist. At the end, we will give you some additional tips and details to look for as you start your search for a new bathroom faucet replacement. This bathroom sink faucet from PARLOS has a sleek brushed nickel finish which will blend well with any bathroom decor. This stylish faucet requires a 3-hole surface-mount installation, and it comes with two lever handles. One lever handle has a blue dot to show cold water and the other handle has a red dot for hot water. The drain is a push and seal assembly and comes with the necessary supply hoses. The drain sits up high in the sink which may cause a small amount of water pooling in the sink depending on your sink shape. This brushed nickel faucet has a nice arched shape, and it sits high enough above the sink to allow you plenty of room to wash your hands. If you are looking for a stylish, elegant and premium quality faucet for your bathroom, then this Greenspring product is a perfect fit! 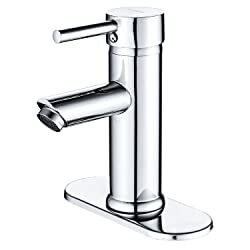 The faucet is stainless steel with a ceramic valve to ensure quality and long life. The total height of the faucet is 6.77-inches and the spout height is 3.54-inches above the sink. This gives you plenty of room to wash your hands under the water flowing out of this stylish faucet. 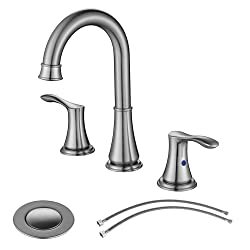 This faucet requires a one-hole center-mount installation and includes two water supply lines with standard ⅜-inch compression threads. You can exchange these for ½-inch flexible hoses if needed. 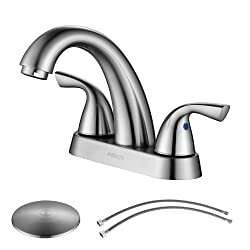 The faucet is stainless steel and includes a 304 stainless steel filter allowing you to save over 30% water. 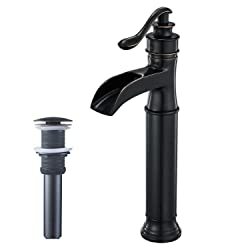 Although this product does not come with a drain stopper, you can install a pop-up stopper to complete your sink assembly. This faucet will add a beautiful new dimension to your bathroom at a budget-friendly price. Are you considering replacing the fixtures in your bathroom with oil rubbed bronze fixtures? If so then consider this two-handle bathroom faucet from Derengge. This faucet is a top quality product with a drip free ceramic cartridge. It even includes a high performance aerator. The faucet has a lead-free solid brass waterway to ensure the water flowing from the faucet is safe and clean. This product comes with a plastic pop-up sink drain assembly. Hot and cold water hoses and accessories are provided for a quick and easy installation. This Derengge faucet requires a 3-hole center-mount installation. It has a maximum water flow rate of 1.2 gpm (gallons per minute) at 60 psi (pounds per square inch). 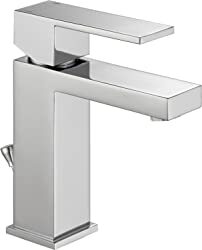 This faucet is a durable, high-quality product that can be installed in commercial or residential bathrooms. This Delta single handle chrome faucet will give your bathroom a modern, chic facelift! 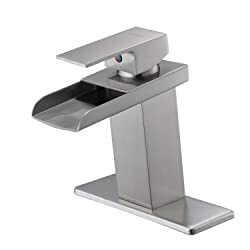 The faucet spout and handle have crisp square edges giving it a box-style look to set it apart from most other faucets. This faucet requires a 1-hole 4-inch installation deck. I can order additional parts if you need to install this on a 3-hole sink. This kit includes a coordinating chrome pop-up drain assembly with a plated flange and stopper. Delta’s WaterSense label on this faucet guarantees that this product will use at least 20% less water than the industry standard. This saves you money without compromising on performance or appearance. You can also buy this product with confidence since Delta backs their products with a lifetime limited warranty. This PARLOS product has a sleek brushed nickel finish to complement the other fixtures in your bathroom. It requires a 3-hole widespread mount installation, and it is compatible with any distance between 8-inches and 16-inches. The faucet has two lever handles and includes a pop-up drain assembly with overflow. To operate the pop-up drain, you press the drain down and you will feel it click into place. This means the drain is completely sealed. To open the drain, you push down on it again and it will click up to drain the water from the sink. If you want a faucet that is stylish and easy on your budget, then consider this PARLOS brushed nickel bathroom sink faucet. I love the newer bathroom faucets with water flow out of the faucet is like a waterfall. This BWE brushed nickel product gives you that experience! It has a wide open channel water spout that will deliver a waterfall of water for washing your hands. The brass construction of this faucet gives you a high-quality product with longevity. You can install this faucet in a 1-hole or 3-hole sink basin deck. It has a single lever handle with a small red circle and a small blue circle to show which direction to turn the lever for hot or cold water. The design of the waterfall outlet spout has improved significantly. The more practical design prevents stagnant water from remaining in the spout for long periods of time. If you want a waterfall faucet experience, then consider this modern Eyekepper brushed nickel faucet from BWE. The sleek brushed nickel finish on this waterfall faucet will stand out in your bathroom as an elegant feature! This faucet has an extra-large enclosed rectangular water spout which delivers a waterfall of water into the sink. The single lever handle makes it effortless to control the flow and temperature of the water. This faucet uses a ceramic disk cartridge that has been tested by opening and closing it for 500,000 times! The brushed nickel finish will resist corrosion and tarnish during everyday use. Each faucet is tested under high water pressure to ensure high-quality and long performance. You will find that this faucet can be installed easily. The 23.6-inch long water supply hoses are great for older home installations in which the water supply valves are often not right next to the sink. Friho offers a 100% money-back guarantee on this product which makes it a risk-free choice for your bathroom faucet upgrade solution. 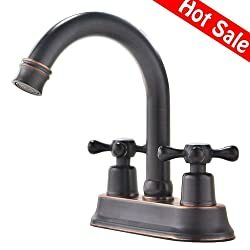 The oil rubbed bronze finish gives this faucet a beautiful antique appearance. It will blend in with any type of bathroom decor. This faucet requires a 1-hole installation base in your sink. The diameter of the hole must be between 1.3-inches and 1.77-inches to install the faucet correctly. This faucet includes a pop-up drain, but the drain does not have an overflow. Hot and cold water hoses and other needed accessories are included in this product. The single lever handle gives you simple control of the water flow and temperature coming out of the open channel water spout. The total height of this faucet is 13-inches with the spout height at 9-inches. This faucet is a perfect companion for a vessel sink that sits on top of your counter. This brushed nickel widespread mount bathroom faucet from Phiestina will add a sleek modern appearance to your bathroom. To install this faucet, you will need a 3-hole construction mount with an 8-inch widespread design. This faucet has a solid brass and stainless steel construction and offers lead-free water distribution to protect your family from harmful materials. The metal push and seal pop-up drain completes this faucet upgrade package. The drain stopper has an anti-clogging basket strainer to prevent the drain from collecting hair and other materials. Although there are no hot and cold water hoses provided, you can easily buy new hoses or use the hoses from your existing faucet. Phiestina offers a lifetime warranty for this product making this a smart choice in bathroom faucets for a bathroom renovation or new construction. If you want to give your bathroom a new modern look, then consider this Lahara faucet from Delta. This faucet requires a 3-hole widespread mount installation and can accommodate any width between 4-inches and 16-inches. The height of the spout is 5 ⅞-inches which gives you a lot of space underneath the faucet to wash your hands. Delta uses a patented Diamond Seal technology to reduce leak points so the faucet will last twice as long as the industry standard. This technology includes a diamond-embedded ceramic disc which requires no lubrication and eliminates wear on seals. This feature gives your faucet longer lasting performance. The Lahara faucet includes a metal pop-up drain to complete the faucet assembly. Delta backs their products with a lifetime limited warranty, so you can buy this product with confidence knowing it is a risk-free choice. 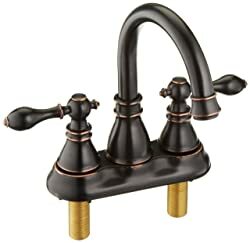 This faucet has a beautiful oil rubbed bronze finish which gives it an elegant appearance. The two metal handles have an older wheel-style appearance with a round center and 4 small spokes sticking out. The center of one handle has a “C” for cold and the other handle has an “H” to show the hot water supply. A 2-hole 4-inch center set installation is required for this faucet. The solid brass construction assures you the faucet will last a long time. Ufaucet offers a 3-year warranty along with a no hassle lifetime replacement warranty! This is a great faucet choice for your remodeling or new construction project. Moen’s Eva faucet has a sleek LifeShine brushed nickel finish which will give your bathroom an immediate uplift in appearance. The LifeShine finish is guaranteed not to tarnish, corrode or flake off for the lifetime of the faucet. A 3-hole mount with a 4-inch centerset design is required for installation of this faucet. It includes a drain assembly which is controlled by a pull lever just behind the faucet. The swan-like spout lifts it higher away from the sink to make it easier for washing your hands. It has a water flow rate of 1.2 gpm with an aerated stream. This faucet also meets WaterSense criteria for water conservation without compromising on performance. Moen gives you a limited lifetime warranty on this faucet against leaks, drips and finish defects. 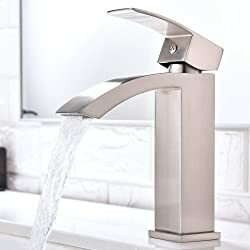 With Moen being one of the leading manufacturers of plumbing supplies, you can buy this faucet with confidence knowing it is a high-quality product. There are many things to consider before you buy a bathroom faucet. Not only are the color and design important features, you must also consider the type of sink you have and the new faucet installation requirements. Some faucets require a single hole and some require 3-hole installation decks. Check out the features below for some additional guidelines on what to search for in a bathroom faucet. You can find faucets in many colors and finishes. You should consider the other fixtures in your bathroom before you choose a particular finish. If everything else in your bathroom is chrome, you probably do not want to buy an oil rubbed bronze faucet. It would appear out of place with the rest of your bathroom decor! 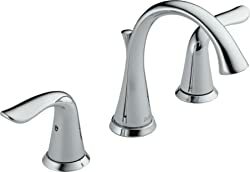 You can find faucets that have a chrome finish, brushed nickel finish, oil rubbed bronze finish and even a gold finish. The options are numerous so be sure you are picking the right finish to fit in with the rest of your bathroom fixtures! The installation process for a faucet is not difficult, but you need to pay attention to the number of required holes besides the spacing for the faucet. The number of holes required for a faucet can vary from 1-hole up to 3-holes. The sink you will attach the faucet to must have the same number of holes that the faucet requires. For example, a 1-hole faucet will not fit correctly on a sink with 3-holes. 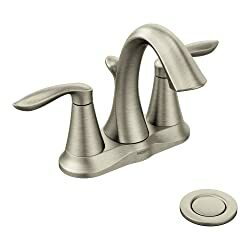 It is possible to get deck plates to hide additional holes, but you will need to be sure that the faucet connectors can accommodate an additional thickness. Some faucets require a widespread configuration. This means that the faucet spout and handles are not in a single unit that fits together on the sink. A widespread installation requires appropriate hole spacing that can be anywhere from about 4-inches up to 16-inches or even more. You should consider if the faucet requires mounting directly on the sink or if it requires installation on a counter surface or the wall. There are many mounting options available so be sure you decide what you are interested in and what your current sink configuration is before you make a choice. Water spouts come in different shapes, sizes and even heights. Many of the traditional faucets have a round spout for water flow. The latest trend in water faucets is the waterfall style. This type of faucet spout will disburse a wide stream of water from the faucet giving you the impression you have a miniature waterfall in your bathroom. A waterfall spout can have an open channel design where you can literally see the water as it is coming down the spout before it falls into the sink. These types of spouts are often difficult to keep clean so be sure you are aware of this before choosing this water spout style. Waterfall spouts can also be enclosed with a wide-mouth rectangular shaped spout opening. These water spouts are easier to clean but do often have sharp corners to watch out for around small children. Before you decide on a faucet, you need to think about your drain requirements. Some faucets will include a drain assembly that is operated by a pull lever located behind the faucet. It is becoming more common that faucets do not include drain assembly kits with pull levers. Instead they will provide what is referred to as a pop-up drain. WIth this type of drain assembly, you simply push down on the drain until it clicks into place or seals shut. You can then fill the sink with water and be assured that the water will not drain out. Once you finish with your use of water in the sink, you must then push down on the drain until it pops back up and releases the water. This type of drain is not ideal for some individuals as they have to place their hand into potentially dirty and used water to push on the drain to release the water. Keep this in mind as you are searching for a faucet for your bathroom. Bathroom faucets can enhance the beauty and appearance of your bathroom. Whether you are doing a bathroom remodel or decorating a brand new bathroom project, the right sink faucet can make or break the overall appearance of your bathroom. 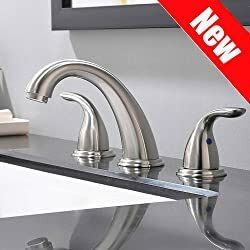 We hope you will consider the guidelines we have provided along with the product reviews as you narrow down your choices for a new bathroom faucet.